We are finishing our sixth week on the road. After leaving South Dakota, we traveled across the bottom of Minnesota and then headed south for Forest City, IA, to tour the Winnebago plant. They are a big operation and the tour was pretty non-specific. However, we did find a great city park with 50 amp, a nice bike trail, along a stream with a waterfall, across the stream from a golf course, and little used. Here's the view from our site. We ended up staying here 5 days. One of the fun parts of being full-time is being able to make spur-of-the-moment changes to your itinerary. That's just what we did when we decided to detour to eastern Iowa to visit the Amana Colonies and Iowa's Amish community in Kalona. Kalona was more English than Amish but they had good ice cream. The Amana Colonies were founded by Inspirationalists in 1854. This group of people was part of the Spiritualist movement within the Lutheran Church founded in Germany in the early 1700's. These German Inspirationalists practiced full communal life institutionalizing precepts concerning dress and lifestyle. You can learn more about them at Amana Colonies. Today, there are lots of shops (which don't do us much good :) ) and also a smokehouse and bakery where we did partake of cinnamon rolls and summer sausage. Next, we decided to make a stop in Des Moines for the Iowa State Fair, one of the selections in the book, "100 Places You should See Before You Die" which was on the New York Times bestseller list. This state fair is HUGE and agricultural displays and animal judging difficult to find and get to. Plus, the crowds were astronomical. Additional pictures are in the photo album. So, what has it been like since hitting the road? Paul would say that he grieved the first month, but has gotten into it now and enjoying himself. I still get a little melancholy when I think we don't have our King Charles home anymore, but it is outweighed by what we're doing. Molly seemed depressed from our leaving her in the motor home so much because of the heat. We're taking her for more walks, out on errands (while one of us stays in the car), and swimming, and she's doing much better. Since broadening our horizons was one of the reasons we wanted to travel, we thought we'd list some of our observations from the first month. When it comes to naming cities, we’re not too original…we’ve passed Altoona, Williamsburg, Carlisle, Mercer, Buffalo, Butler, ….to name just a few. In Iowa, there are fields of corn for as far as the eye can see…but finding corn for dinner at a farm stand is just about impossible. In the churches we have visited, families worship together…children and teens. In the Midwest, we have seen more RVs in driveways than swimming pools in backyards. Housing “plans” are not as numerous in larger mid-western cities. We’ve seen lots of apartments or condos…a number of fancier ones with porches and garages. The Iowa State Fair had the best fair fare we’ve ever had. Twizzlers are a must-have as we travel. 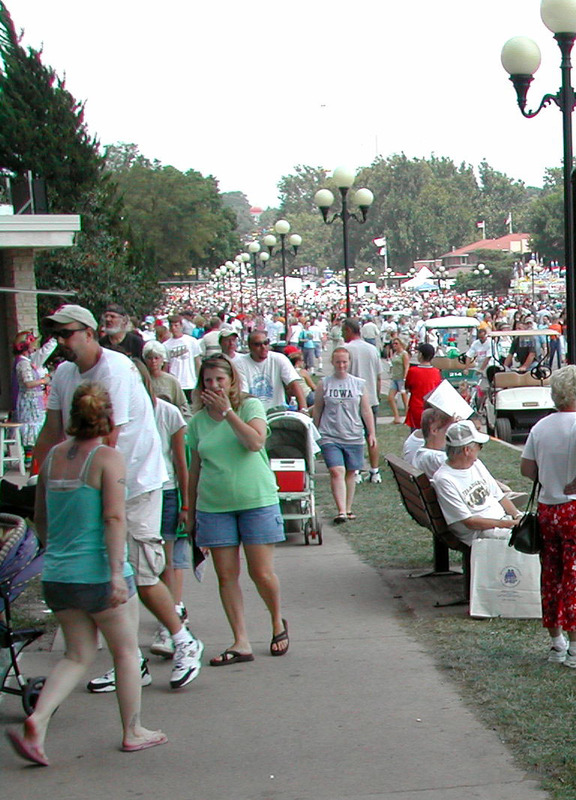 The Iowa State Fair showcases a lot of local talent, making it feel like more small town. In the churches we have visited, our hearts were warmed to see teens showing affection to parents and affection shown between siblings. In Iowa, mid-grade gasoline is cheaper than regular…Paul hasn’t be able to figure that one out yet. In Missouri and South Dakota, the air was cleaner...you could see forever. Dry heat is still hot, but you’re not as uncomfortable as you are with high humidity. 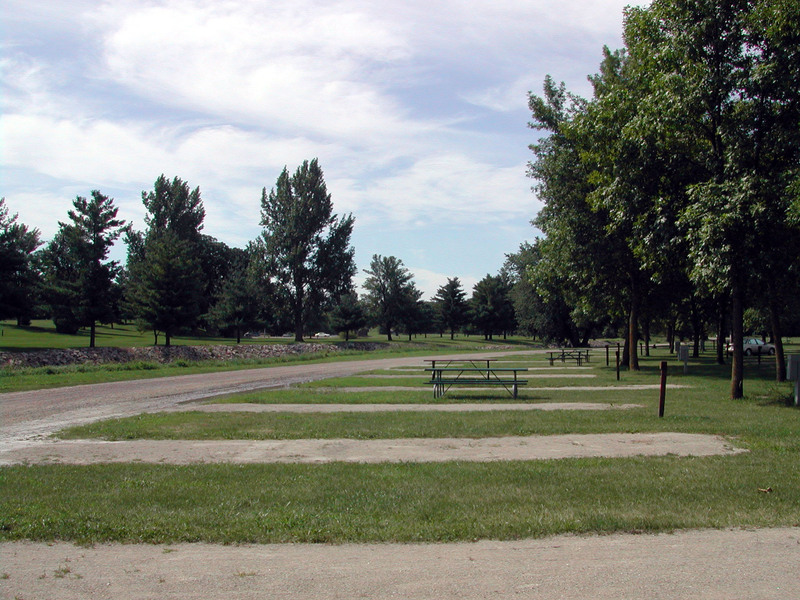 Many small towns have beautiful, well-kept parks…but we rarely saw them used. Many counties have beautiful parks with camping and boating facilities. In rural Iowa, most side roads are gravel and dirt. Overall, drivers are not trying to conserve fuel by reducing their speed. In the Midwest, streets are named by number...we shaw 440th Street in the country, far from a city. Roads can have three names, i.e. Highwy 65, CR J, and 162nd Street NW. Makes using the GPS a challenge. Roads change names after crossing a highway. In South Dakota, every little bar or store that has a slot machine calls itself a casino…and there are A LOT of them. There are places in this country where you can travel miles and miles and see no one OR pass through a town with a population of 52. Overall, life runs earlier in the central time zone. Small towns do not have mailboxes placed around town where you can deposit outgoing mail. You have to find the post office. What an opportunity we have to see how much people are the same and yet how different, too. We praise God for giving us this opportunity!